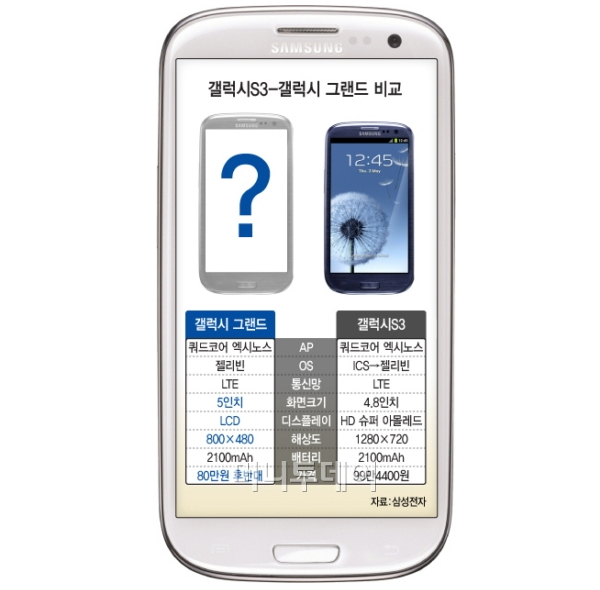 Speculation of a new Galaxy branded device, named the Galaxy Grand, has come out via a tipster onAndroid Authority, who says the device will be like a “mutated version” of the Galaxy Note II and the Galaxy S3. While we haven’t heard many rumours about the Galaxy Grand, reports are Samsung are looking to make the device Korean only for the first few months, with expansion into Europe and US with the next version or later on. The Galaxy Grand is said to sport a 800 x 480 resolution, which is rather poor when looking at the Note II and most flagship smartphones nowadays. It will be powered with a 1.4GHz quad-core Exynos 4412 processor, the same one we’ve seen in other Samsung devices. Other features reportedly on the Galaxy Grand are LTE support, NFC and Android 4.1.1, with a 2100mAh battery. This all seems like very top-end gear for the smartphone, even with the poor display resolution. Android Authority are still unsure about pricing, with them citing the source’s pricing at between 800,000 – 100,000 won, around a $600 gap in US markets. While this doesn’t do much for us finding out if the Galaxy Grand is high-end or entry-level, it may show that it is in developing stages and pricing for the unit is already there. A five inch Samsung smartphone may be the mid-way between the Galaxy S3 and Note II, although realistically there isn’t that big of a gap. We’ve already seen Samsung launch the Galaxy Mini, which came at four inches, they may be looking to pen their markets and make sure customers get the exact size they want. Tapscape will keep you updated on any news and rumours we find on the Galaxy Grand. Of course, we do have reservations about if this report is real or not and if the phone will ever hit US shores. With rumours about theGalaxy S4cropping up, Samsung may be pushing their work to that flagship, rather than this mid-range mobile.